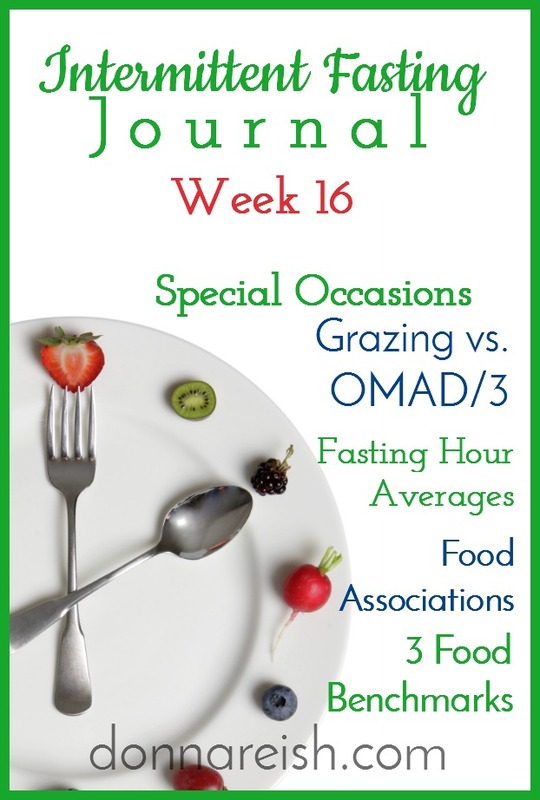 Welcome to Episode 16 of The Intermittent Fasting Journal Podcast/Videocast! In this episode, I tell about another week of Daily IF. Reishes’ Fasting and Feasting found Hubby and I at a 50 pund week loss together (me for 20 weeks; him for 12 weeks at that point in our weight loss!). He is losing FAST…..36 pounds in three months. I am losing pounds slowly but losing inches super fast–at 14 pounds in 20 weeks. I then discuss how quickly you can lose recently “gained weight” with Daily IF. (And what really is “weight loss”?) I tell about my protocol of OMAD/3 (One Meal a Day broken up into three eating times) rather than the grazing approach–and its effects on cravings and Appetite Correction. Furthermore, I explain how opening my window with a low carb snack/something nutrient dense has done four things for me: (1) Lowered my total carbs for the evening by 20% or more; (2) Extended the “fast” (“fasting mimicking”) by a couple more hours; (3) Warded off cravings; (4) Helped with Appetite Correction. Then I moved into Listener Lessons—all about Special Occasions, vacations, long weekends, and more. I remind listeners that you can “eat anything you want but not everything you want”! I taught about how to determine if something is truly a special occasion. And how it is the diet mentality that causes us to look for ways to “go off” our eating protocol. However, with fasting we should look for ways to guard our fasting hours! I instruct listeners to tweak days leading up to a special occasion and keep a high fasting average so as not to disrupt Fat Adaption. I walk through food associations and how we need to disassociate many of them instead of using them as excuses to overeat, fast shorter, etc. I also instruct listeners in the importance of getting rid of perfection. We are after progression not perfection in Daily IF. Get rid of the “all or nothing” mentality! Don’t punish yourself, but plan and make allowances for special occasions. Our episode today is brought to us by the amazing, natural, plant-based supplement called Ease. It contains four natural ingredients that will help with weight loss, inflammation, discomfort, and more: New Zealand Green Lipped Mussel, Bromelain, Tumeric, and Serapeptaise. Learn more about this product here. I have just created an amazing download to teach people how to get started with Daily IF.– it is a 20-page booklet with four different start up protocols all laid out for you and tons of details about fasting. It’s called Donna’s Daily IF Start Up Charts, and it’s yours free! B. Listener Lessons–Getting ready for spring and summer events! 1. What are special occasions? iii. Foods that you enjoy–social, community, family, traditions, fun! D. Today’s Sponsor/Supplementation—Plexus Ease! Anti-inflammatory! Weight Loss! And More! a. New Zealand Green Lipped Mussel: amazing anti-inflammatory; indigenous people no arthritis!